m3property examines some key questions being asked of the retail sector at current. Is the continual negative press influencing investment decisions? Have the underlying investment fundamentals of retail property changed? Is the retail sector being overly scrutinised in comparison with other major sectors? To answer these questions, we need to look at both the structural and cyclical changes occurring in the property markets, their impact on property investment in Australia and where the retail sector sits compared to other major property investment sectors. Cyclical factors are temporary and change as markets work through the property cycle, whereas structural changes are considered permanent and change the way the sector works. At current, all sectors are undergoing structural changes due to global mega trends. These changes are necessary for the sectors to remain relevant to consumers as their preferences evolve. The sectors, however, are in very different positions in the property cycles. 1. 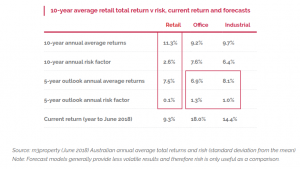 Investment Returns and Risk – Does retail need to be part of a balanced property portfolio? When looking at an investment, total return can provide a complete picture of how an asset is performing over varying time frames and how it may perform going forward. This was compared over the short- medium- and long-term and compared to the risk for the sectors, calculated using the standard deviation of the total returns over the various time frames. When we review the performance of the last ten years (long-term), retail has the highest average return and lowest risk, based on standard deviation from the mean. It is the only sector within the optimal investment (Low risk/High return) segment of the Risk/Return chart below. This period includes the recent retail slowdown and part of the global financial crisis, indicating that slowdowns in the retail market are less severe than the other core sectors. This highlights the value of retail within any long-term portfolio. Over the medium-term (five years) each of the major sectors provided low risk and high returns. In terms of returns, office outperformed, however, its risk was the highest of the sectors. Industrial provided the next highest returns and risk. Retail continued to have the lowest risk of the three sectors but had lower returns. Over the short-term (three years) each of the major sectors provided low risk and fairly high returns. In terms of returns, office outperformed, however, its risk was the highest of the sectors. Industrial provided the next highest returns and risk. Retail had the lowest risk of the three sectors but had lower returns. The chart above shows the importance of property in adding value to investment portfolios with all sectors performing within the low risk/high return quadrant post the Global Financial Crisis. Leasing risk is considered lower for retail property due to the relatively large number of tenancies within a centre, which diversifies expiry risk. In addition, major tenants are secured on longer lease terms in the retail sector compared to the office and industrial sectors. There is currently increased focus on major tenant leasing risk given the under performance of Department Stores and Discount Department Stores, and with many major tenants seeking shorter initial terms of say 10 or 15 years. The concern is that this may have increased the risk profile of retail property. Whilst this is a reasonable proposition, what also needs to be considered is that major tenants generally only contribute circa 40% of the income of Regional centres and pay relatively low rents. Shorter lease terms will provide landlords with the flexibility to reconfigure major’s tenancies and potentially lease to new and more appealing retailers that provide the best experience for shoppers. Should major tenants vacate or downsize, stronger, dominant centres will be better placed to backfill with alternative uses which increase dwell time of patrons, such as leisure operators. Other opportunities exist to backfill former major tenancy space with retailer storage to support the on-line businesses of retailers located within and around the centre. “Last Mile” delivery can be the most costly part of the delivery of goods. 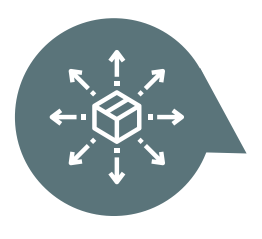 Providing retailers a solution to hold their on-line stock close to their bricks and mortar store and close to the delivery area of consumers may become a more feasible alternative for both landlords and retailers. The relatively large number of tenants and shorter Weighted Average Lease Expiry (WALE) of specialty retail tenants allows landlords to more quickly adjust to changing market conditions and therefore keeps the income volatility lower for the retail sector. Retail assets capture downside and upside risk in a progressive manner. The following chart indicates where current returns for the retail, office and industrial sectors are in comparison to long-term returns of each sector. 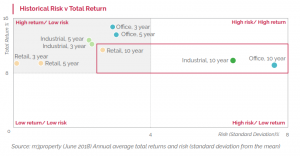 Industrial and office total returns are well above their respective long-term averages, while retail total returns are below the long-term average. While low property yields and rising bond yields are key risks. Retail trade is expected to rise, supply is expected to slow, population growth to remain strong and rental growth is expected to increase. Retail investment returns are therefore expected to improve overall. Investors in the retail sector appear favourably placed to achieve improved returns going forward. 4. Potential for yield softening and slower rental growth. Retail property has provided strong yields with low volatility over the last ten years. Whilst the sector is facing structural change, m3property forecasts retail property will provide comparable returns to the office and industrial sectors over the next five years with low forecast volatility. World real GDP is forecast to grow strongly over 2018 and remain high over 2019, according to BIS Oxford Economics. Growing global wealth leads to greater spending by business, government and consumers and therefore has a positive flow-on effect for the retail property sector. The Australian dollar is forecast to fall over the medium- to long-term outlook. From 2012 to 2016 the Australian dollar continued to grow resulting in some key sectors slowing including tourism, education, manufacturing. 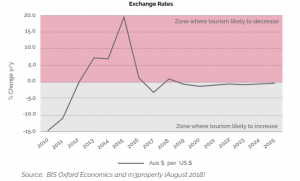 With tourism spending, and to some extent, education being contributors to retail trade the forecast fall in the Australian dollar is positive for the retail sector. For new investors the cost of investing into Australian property is likely to be lower. On the other hand, existing investors who did not hedge are likely to see a fall in their Australian investment’s value. While a falling Australian dollar could provide currency risk for offshore investors looking to divest at the low point of the cycle if hedging was not sourced, it will attract overseas capital and purchaser demand by making Australian assets comparatively cheaper. We see the lower Australian dollar as a key opportunity in the short term for offshore capital looking to invest in Australia. A case study of internationally located retail centres owned by Unibail Rodamco Westfield, compared to Australian regional centres was undertaken in September 2018 based on the end of financial year reported data. The aim was to assess the attractiveness on a yield basis of Australian regional centres compared to similar centres in major regions around the World. Australian prime regional centres ranked as having the fourth highest yield in the selected sample. This makes investing in Australian retail centres an attractive option for overseas investors. Australian prime regional centres ranked as having the fourth highest yield in the selected sample. When a market is outperforming more supply comes into the market, often delayed and ultimately diluting and softening the market. This results in a slowing of rental growth as negotiating power moves to tenants. Developers then stop building and the market corrects over time as the lack of space pushes negotiating power back towards the landlords. The chart below shows retail building approvals, which are a forward indicator of supply for the retail sector. It shows approvals above long-term average levels over the past six-years to December 2017. Apart from recent years, which has seen the emergence of more food and beverage-lead supply, the supply over much of this period was heavily weighted to fashion usages. This influx of GLAR over the past six-years has had a dilutionary impact across all retailers. This has compounded to effect vacancy levels and sustainable rents. This dilutionary impact has been particularly relevant in the fashion category, which at the same time has been impacted by price deflation of goods sold. 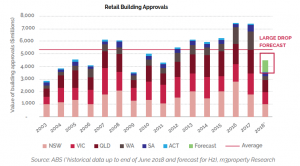 The first six months of 2018 has already seen a significant reduction in building approvals for retail space and it is forecast to be well below long-term averages over the year. This indicates that the market is likely to be at or near the top of the current supply cycle. Over the past two cycles there were 3-4 years of below average supply, which allowed the markets to recover and then grow before development started again. With the supply pipeline reducing, and population growth in Australia remaining strong (discussed later in this report), the supply/demand equation should move more favourably towards retail landlords in the short-term. The main retail trade categories experienced reduced growth over the year to June 2018 compared to the prior year, except for food, which was stable, and department stores, which recovered after a significant fall over the previous year. Clothing and household goods have both experienced a decrease in growth over the previous two years, as the focus moved to food. The stabilisation in growth is due to food retailing reaching saturation point in some shopping centres. For the cafes, restaurants and takeaway category the saturation point may have been exceeded with the rate of Moving Annual Turnover starting to taper off. 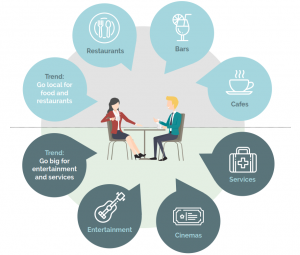 This is less relevant in dominant centres or town centres where dwell times of patrons is continuing to increase through the growth of entertainment options. Investment returns will vary across assets depending on whether the centre has the appropriate tenancy mix to cater for various growing and declining retail categories. Therefore, having experienced and leading retail managers will be a critical determinate of individual asset returns. For dominant centres with strong catchments there is likely to be greater tenant demand from both individual stores and chains and therefore managers are likely to have greater flexibility to remix and respond to changing trends as required. This should result in stronger returns for these centres. A further strength of dominant centres is that retailers in dominant centres have more productive floor space (higher turnover) and therefore retailers will continue to trade in dominant centres. If retailers reduce store networks, it will be the more dominant centres where retailers chose to remain. According to BIS Oxford Economics (August 2018) retail trade is forecast to improve over the short- to medium-term. 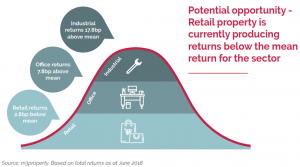 Whilst overall this bodes well for the retail market moving from its current position near the bottom of the total return cycle to the recovery area of the cycle, most of the increase is in the on-line component. Retail Sales Value is expected to continue to grow year-on-year over the medium-term. Whilst the rate of growth of on-line Retail Sales Value is expected to outstrip bricks-and-mortar Retail Sales, bricks-and-mortar growth is expected to be positive. 9. Wages Growth – halves, but is the cycle starting to show signs of turning? Figures released by the Australian Bureau of Statistics (August 2018) show wages grew by just 2.1% in the year to June 2018, equal to inflation, while private sector wages retreated relative to inflation, rising by just 2.0%. This has negatively impacted retail spending. However, the decline appears to have stopped, reaching its nadir in 2017, and wages growth now appears to be moving upwards. Infrastructure spending, which is strong nationally, is expected to continue to place upward pressure on wages growth. While it is just one of the factors impacting retail trade, an upturn in wages growth will have a positive impact on retail trade. These trends are changing consumer preferences, driving the movement toward on-line retailing, merging on-line and bricks-and-mortar retailing and opening the Australian market to overseas influences and trends at the same time as international markets. Previously Australia has lagged other markets and therefore has not seen the full benefits of some trends. The growing Australian population is resulting in the increasing density of cities and high-rise living becoming more prevalent. The population is also aging in most developed countries due to the impact of baby boomers and longer life expectancy resulting in evolving consumer preferences. 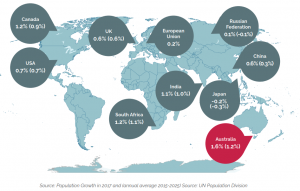 According to the World Bank Australian population growth (of 1.6%) exceeded World growth averages (of 1.2%) in 2017. BIS Oxford Economics are forecasting Australian population growth to be 1.7% over 2018 while World growth is forecast to be 1.1%. This is a key driver of retail sales growth. These factors have helped drive the growth of on-line retailing and changing preferences of consumers. Centres need to be agile and responsive to trends, working with tenants to obtain the best outcome for consumers. Shopping Centres in Australia are often located on large parcels of land in key locations with flexible planning provisions. This provides a strong position for owners to exploit opportunities presented by a growing population by creating town centres through developing mixed uses on shopping centre sites. Such mixed uses include entertainment, hotel, office, apartment, student accommodation, civic or other uses. However, the existing design of particular centres will be important in determining if and how further uses can be developed on the land in a feasible manner. It will be the centres that dominate their catchments, whether that be in capital cities or regional cities, that will be well placed to create town centre locations. Whilst regionally located centres will witness lower levels of urbanisation, they may be more immune to leakage to on-line shopping due to logistical challenges of on-line retailers servicing their catchment. The large Regional Shopping Centres that are located in regional areas will continue to serve as the “City Centre” and will therefore be in a stronger position compared to other centres that may be in Metropolitan locations but are less dominant. Entertainment uses do not need to be retailers or businesses. Recently in Australia we have seen the introduction of play centres, gardens, water play areas, zip lines, BBQ areas, etc which are all designed to make centres a destination and increase dwell time. Australian consumers continue to evolve along with their ever-growing expectations of a convenient and positive experience. 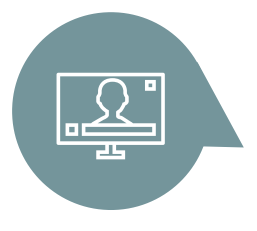 The product needs to be customisable to consumer preferences, consumers must have the goal or services within a short period of time from initial demand for the product or service and consumers expect to be able to pay for it without using cash. This has forever changed the way retail works. There have been some winners and some losers from this change in consumer preferences. Food, cafes, restaurants, services and entertainment based companies and retailers have benefited, whilst clothing retailers have generally found conditions more challenging. While food, cafes and restaurants have seen growth in recent years, for all centre types, their expansion is reaching saturation point in some centres and is resulting in increased competition for the same consumers and therefore falling overall revenue. This often results in cost cutting and then the positive experience becomes more difficult to achieve. The balance needs to be right for success. Shopping centres have cultivated a rise in service-based tenants over recent years. Larger centres have an advantage in this area as they have the space to dedicate to these specialty tenants and still place the provider in convenient locations within the centre. Entertainment continues to be an important drawcard for centres and if done in a co- ordinated manner through the centre with effective advertising, it can attract consumers. The concept of increasing the dwell time of patrons is not new, but the recent focus on increasing a centres entertainment preference can significantly increase dwell time. This leads to an increase in spending across other usages. Lego Land, Holey Moley, Megamania, Kidzania, Crayola Experience and Strike Bowl are alternative usages that can backfill large vacancies which may be created by a major tenant downsizing or vacating, and which are often in secondary locations within a centre. Entertainment, Food and Beverage are serving as draw card “Anchor” tenants. It is the dominant centres, especially those with a mixed-use component that will be best placed to attract these tenants and exploit this opportunity by becoming “town centres” acting in the manner of a mini-CBD. Entertainment uses do not need to be retailers or businesses. Recently in Australia we have seen the introduction of play centres, gardens, water play areas, zip lines and BBQ areas which are all designed to make centres a destination and increase dwell time. Overall this indicates that smaller centres will continue to perform due to their convenience and offering of essentials, while larger centres will benefit from offering more than just a typical retail experience. Australia has relatively strong population growth and is one of the most urbanised countries in the world with 67% of its population living in the state capital cities (ABS Census 2016) and 89.6% of the population living in urban areas (World Bank, 2016). There is currently a strong move towards high-rise living due to this population growth. The resulting increase in population density provides opportunities for existing shopping centres to exploit the growing population within their catchments. The rise in apartment living in Australia has coincided with the rise in food, beverage and entertainment spending and shopping centres are well placed to capture this expenditure growth. Globalisation is resulting in new international trends/ideas impacting the Australian markets. These are impacting the way retail leases are negotiated, the way products are delivered to customers and costs and earnings of centre owners. With retail centres it is all about quality and adapting to change quickly while structural changes continue to impact. The Australian market is going to see greater influence of overseas trends. International firms such as Amazon from the USA and Alibaba from China continue to bring international trends to Australia through its relationships with local retailers. Retail chains are also becoming more active in rental negotiations with landlords, with some chains negotiating deals across entire portfolios rather than just for single assets. Landlords with stronger performing centres within their portfolio may be able to attract more favourable lease terms than those with under-performing centres. Overtime it will be the more dominant centres that are best placed to take advantage of this opportunity. Traditionally rents have been benchmarked by gross occupancy costs. However, on-line sales and change of traditional retailing styles including inventory reduction, on-line delivery and negotiation of leases by chains are now considerations when determining the value of retail space. The value of brand exposure through a bricks and mortar store, regardless of whether sales occur in-store or on-line will remain an Investors in retail property need to be selective to ensure they are investing in strong dominant centres. Landlords with portfolios are well placed to cater to future retailer needs, however, they will need to be innovative in rental negotiations. Investors that have a significant portfolio of strong centres that dominate their catchment will continue to have an advantage to negotiate more favourable lease terms. Technology changes have driven changes to the way consumers compare prices, shop and obtain products. To continue to attract retailers, centre owners need to ensure their centres can complement and support these changes. 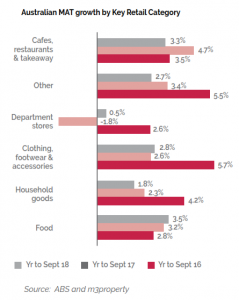 According to National Australia Bank on-line retail accounted for 8.9% of traditional bricks-and- mortar retail spend as September 2018. While this is growing, it is important for retailers to recognise that omni-channel retailing has the ability to account for different consumers preferences, provide a better customer experience with no service gaps and therefore improve overall sales, compared to a firm being just on-line or just in bricks-and-mortar. Retail landlords need to be prepared to invest in strategies that work for omni-channel retailers and attract and engage with increasingly tech- savvy consumers. Opportunities are stronger for those landlords who best achieve a model that links both on-line and bricks-and-mortar retailing and continues to evolve as preferences change. Landlords will also seek retailers that operate seamlessly over both on-line and bricks and mortar channels. Retail landlords are well placed to capture significant consumer data. Store transaction data can reveal where patrons live, what retailers they visit or conversely what retailers they visit in other centres. Wi- fi data can provide landlords with targeted marketing and can reveal traffic hotspots in a centre and visitation patterns. Car park boom gate data can also reveal visitation patterns and identify dwell time. Savvy retail landlords will have the opportunity to utilise this data to better design centres, improve tenancy mix and provide targeted marketing to consumers. This should lead to further income growth opportunities. Environmentally Sustainable Design (ESD) will continue to be a key focus of landlords. With utility costs increasing and the cost of solar technology decreasing, a business case for utilising the roof space to generate solar electricity is becoming a reality. ESD technology is rapidly improving and we expect other initiatives will be developed to either reduce utility costs or provide additional revenue streams. The structural changes of the retail sector have been well documented and provide ongoing challenges for retail property. However, strong opportunities will present for landlords with dominant centres, who are innovative, evolve tenancy mixes, and create mixed use town centre destinations. Australia’s growing and increasingly urbanised population will seek experiences and many shopping centers are well placed to cater for this demand. Retail yields are forecast to soften in the short-term, while fundamentals improve. This should result in sustainable growth in the sector over the medium-term. While the retail sector will continue to face structural challenges, there exists strong opportunities for retail landlords who are prepared to be innovative, invest in strategies to link on-line and bricks and mortar retailing, create optimal and evolving tenancy mixes, and allow centres to become town centres or destination places. 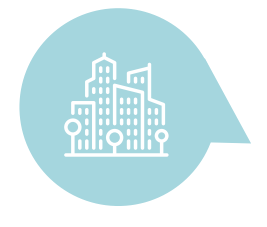 Centres located on large land parcels will allow opportunities to introduce mixed use development and entertainment usages to increase visitation and dwell time. We have seen recent transactions on both an individual and a portfolio basis that demonstrate a softening in yields for centres that are of a secondary grade. However, we consider these transactions to be a resetting of investment parameters between prime and secondary grade assets that will lead to more stable returns. There are a number of cyclical factors that indicate that the retail sector is well placed to benefit in the short medium-term, including the slowing of the supply pipeline, increasing world wealth, retail trade growth and wages growth. 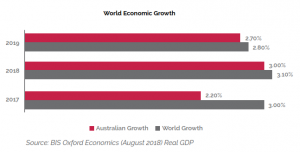 Globally, Australia benefits from strong population growth, an increasingly urbanised population, relatively strong retail investment yields and a decreasing Australian dollar making investment attractive. The strong population growth will also assist in improving the current floor space supply imbalance. Investors in the sector must ensure that they are investing in dominant centres with active and knowledgeable asset managers. It is the dominant centres that will continue to attract tenant interest, be resilient to change and best placed to introduce entertainment and mixed uses. Retail property is expected to perform comparatively well against office and industrial property over the medium-term, with relatively lower return risk. In summary, the retail sector still provides investors with many investment opportunities and should continue to form part of a diversified portfolio.